This is my first post for my Project 52 - one photo in a week. Week one starts on my birthday! People and places - I thank the Lord for meeting new people and going to places. Above: She's physically challenged. 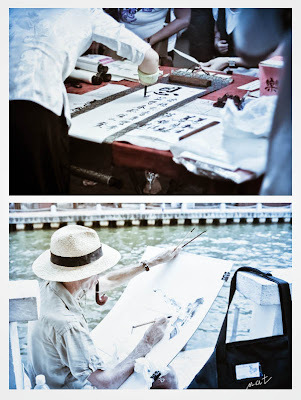 But what she does best - Chinese calligraphy. Below: The artist along Melaka River. With his pipe, paper and the painting. how's malacca? baby friendly ba sya?